There are two extremes with varicose veins. People have either heard varicose veins are dangerous and a threat to life. Or they have heard that varicose veins are not a problem, live with them. The truth lies somewhere in between. Many people live for many years without experiencing problems from their varicose veins. However, varicose veins are more than a cosmetic problem. Symptoms from varicose veins include pain, heaviness, itching, swelling, and skin discoloration. Once present, varicose veins will not go away without treatment. Medical insurance companies will usually cover varicose vein treatments if symptomatic, thereby, acknowledging that varicose veins are a medical problem. But are varicose veins dangerous? Yes, varicose veins can bleed spontaneously. The picture above is from a Lakeshore Veins patient, vein clinic Mequon, WI, who had a spontaneous vein bleed from the small area in her lower leg. It took 20 minutes to stop the bleeding and there was a large amount of bleeding. Usually the veins that bleed are the blue veins close to the surface on the lower leg. Also, small leg ulcers can also bleed. Classically a person with varicose veins steps out of the shower and notices a pool of blood. Often, they deny trauma to the area. The hot shower makes varicose veins prone to bleeding because the warm water dilates the veins and softens the skin. The bleeding can be scary and can seem like a blood vessel bursting. However, the bleeding usually stops without serious consequences. Generally, the bleeding can be stopped by elevating the leg above heart level and placing point pressure over the wound. However, the bleeding can be severe and rarely fatal if appropriate pressure is not used. Yes, people with long standing varicose veins can develop leg ulcers. 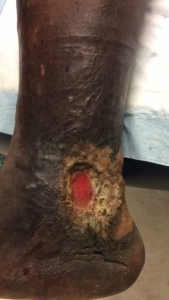 The picture above shows an ulcer around the ankle in a 45-year-old male seen at Lakeshore Veins. He had an ulcer for 3 years and we were able to help treat this ulcer and get his skin to heal. Venous insufficiency causes 70% of lower leg ulcers in the US. Venous insufficiency is the most common reason why people develop lower leg ulcers. According to a screening study by the American Venous Forum there are approximately 2.5 million people in the US with varicose veins and approximately 20% will develop venous stasis ulcers. Therefore, it is important to treat venous insufficiency to prevent recurrent venous stasis ulcer. Discuss with your physician any skin discoloration or skin breakdown. 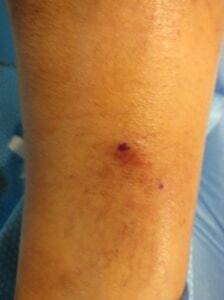 For more pictures of venous insufficiency see our blog. Yes, people with varicose veins have a higher incidence of deep vein thrombosis also known as DVT. DVT is a serious condition in which clots develop in the deep veins. The clots can travel to the lungs called pulmonary embolus or PE. PE can be fatal. There is a recent study showing that people with varicose veins had a 5 times greater risk of developing DVT. According to the Center for Disease Control, approximately 1 or 2 out of a thousand people develop DVT each year. So even a 5-fold increase only increases the risk of DVT to 5-10 out of a thousand per year. Overall small numbers, but over a lifetime this may pose a significant risk Therefore, it is important to discuss risks with your healthcare provider. Complications of varicose veins do exist, and it is important to discuss your concerns with your healthcare provider. Many treatments are available. Byard RW, Gilbert JD. The incidence and characteristic features of fatal hemorrhage due to ruptured varicose veins. A 10-year autopsy study. Am J Forensic Med Pathol. 2007;28:299–302.